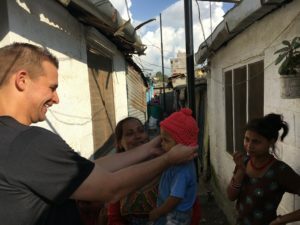 It’s taken me longer than normal to write this mission trip summary. Part of that is because of continuing to process some things I experienced and how best to try to communicate them. Often, I find it quite difficult, because the world in which I live is very different than the parts of the world I travel. For example, it is hard for us to truly relate to what life would be like growing up in a “slum.” Perhaps we have some concept of what that word means or images that are evoked, but it’s hard to imagine being a child who has dropped out of school to beg for their family, facing constant rejection, abuse and horrible living conditions. 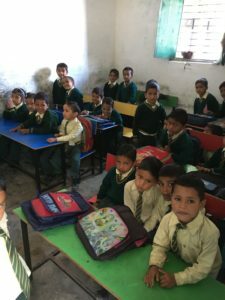 To therefore foresee how life-transforming a simple tutoring and activity center would be for these children would take most of us by surprise. I know it did me. 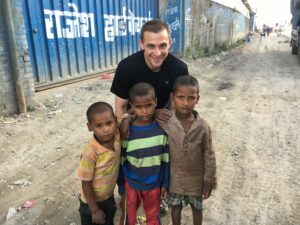 Two years ago, I walked through the worst slum I had ever been in. It was oppressive and depressing. The kids were filthy and something was just “off” in their lives, understandably. However, it didn’t strike me until after visiting this slum again how different the atmosphere truly was. Instead of despair, I witnessed hope. Instead of a weight of oppression, I witnessed life, excitement and joy. Why? Because one couple on the trip two years ago “caught” the vision of how the children and their families in this slum could be changed. The girl in the picture below perhaps captures best what this center means. She was doing very poorly in school. However, since the opening of this center, she has improved so much that she got the highest grade in her whole class! This is not an uncommon story. 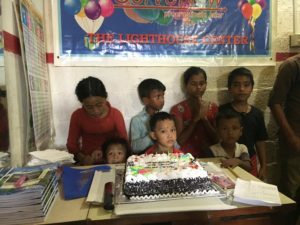 Many children have or had dropped out of school entirely, but now, because of this center, they are rejoining and flourishing. Parents are also astonished at the change there are seeing in their children’s attitude and behavior. While there is a great need for new funding to be able to handle operating costs/expansion to reach more children of this and similar centers; this first phase has proven beyond question that with a little love, attention, care and hope…children, families and communities can be entirely transformed! 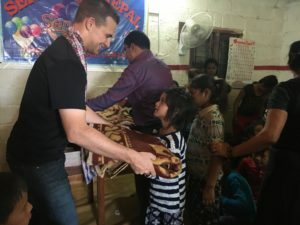 I would witness this reality again when I spent the next day visiting with past graduates of our tailoring program, as well as new students in two new programs that were initiated this month. 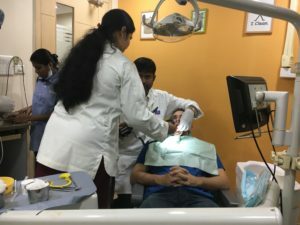 What I saw and heard, made me realize in an even deeper way, that what ServeNow is providing is something far more than physical or practical help. Where we might sometimes see only a “program” “facility” “training” or “sewing machine”; these “things” mean something much deeper to those on the receiving end. It means hope. It means confidence. It means a future. It communicates the love of God in a way that truly opens hearts and meets the deeper more “intangible” human needs. Again and again I heard from both graduates and current students how this has been the catalyst for them to dream again or to see their dreams become reality. It has restored the song in their heart, given them meaning, value and purpose in life and altered their lives significantly. For example, the two women pictured below, recently went through one of our tailoring programs. With the sewing machines they received as a gift from us on their graduation day, they joined forces to open their own shop. Within a matter of months, they had outgrown their tiny shop space and were able to open a larger store. 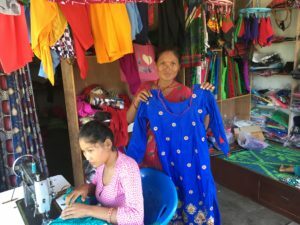 In addition, they have now begun selling other items besides the clothes they make, with the income they have been generating and able to save! (I even bought a set of bracelets for my daughters from them!). Indira is another example. Even before she had graduated our program, she opened her own shop! Once again, within a few months, she could purchase two piglets with income she had generated. She will sell those now grown pigs in another month and through that be able to continue expanding her business! In and of itself, that is amazing and life-altering! However, it goes so much deeper. These are women who were or are at substantial risk of human trafficking. 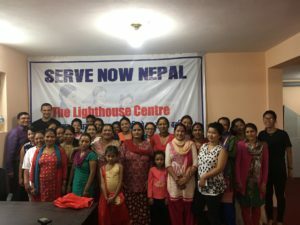 But through the awareness training received from ServeNow, they have formed groups of other women to address this issue, along with other issues such as child labor. This training is not only transforming their lives, but their communities! The same is true of a new center we just opened last month near a slum with the highest rate of prostitution. Women come from remote villages to the main city of Kathmandu hoping to find a job and a better life. However, in far too many cases they find the opposite and end up in prostitution. We opened this center to provide an alternative. To provide hope and restore human value and dignity. The last comment I will make in regard to the tailoring programs is in the form of a picture that touched my heart. 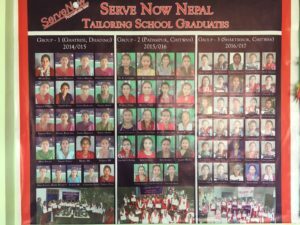 On the wall of our office in Nepal are the faces of the first three groups of tailoring graduates. It became my prayer in that moment that that office wall will be covered with a thousand more faces! 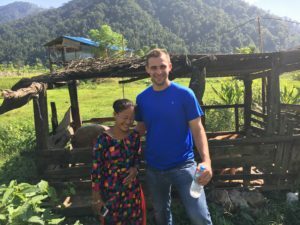 Between the two countries in Asia I spent time in, we did a lot of other things. From providing aid to those affected by a recent fire in the slum where children come to our center, to giving warm winter clothing to children and elderly people in need, to spending time with orphan and HIV children we take care of, to much more, it was a full two weeks! I also spent much time meeting with and hearing the stories of hundreds of pastors who live such dedicated lives of sacrifice. 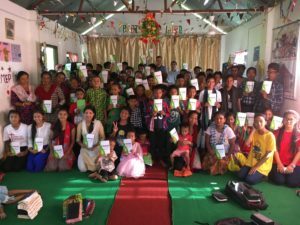 ServeNow has been working with a network of about 1,400 pastors and their churches for the past five years. We have been coming alongside them to assist them in their calling to make disciples and serve their communities. We have designed a series of thirty books, just thirty-two pages each, called The Basic Things You Need to Know. 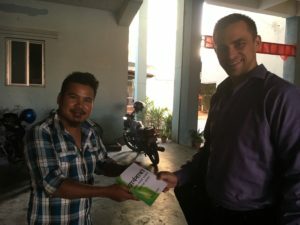 Through our partner organization, MediaServe and other partner organizations, we are providing other literature to aid in evangelism and discipleship. The result has literally been hundreds coming to faith in Jesus, church members understanding for the first time the Basic Truths of the faith, and churches experiencing revival and church growth. This is one of those areas I find difficult to convey the impact of, but when meeting with these pastors, I realize anew and afresh how essential and meaningful these resources are. Without them, they have nothing else and no access or way to afford any others. These are not just “books” that we so often take for granted and don’t bother reading. To these pastors and churches, they are answers to their prayers and words of life to their soul. They have sparked a greater passion for God, for His Word and for sharing the Good News with others. They are strengthening the church to be the church! In fact, it was a joy to release to hundreds of pastors the first book in the series that I have written! 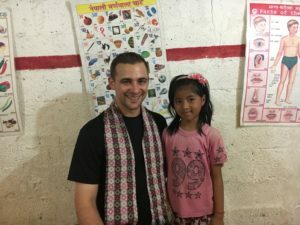 I also visited a new school for forty children in an entirely unreached village. This is the first time Jesus is being introduced to this village. As I stood on the rocks on which this school sits, I couldn’t help but think of Jesus’ promise: “On this rock, I will build my church and the gates of Hades will not prevail against it.” I believe and am praying that by the next time I come back, there will be a church in this village and that the Gospel will begin to then spread to other unreached villages beyond this village. I am also believing we will be able to add more classrooms to this school and perhaps first, a bathroom for the teachers and children! I used the current “outdoor facility” (the earth) and it wasn’t a pleasant or sanitary experience. Speaking of toilets, did you know the first project of ServeNow was installing toilets for children in Uganda at a school? Talk about humble beginnings! But this is exactly what the “heart” of ServeNow is all about: coming alongside God’s people in need, in humility, to assist them in what God has put on their heart to accomplish that will result in life-transformation. It is here that it would be an appropriate time to also make the following statement. 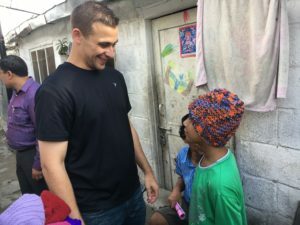 I witnessed again in a more profound way, how “good deeds” really do open hearts to the “Good News.” I am bothered by how in some circles, it becomes an either/or thing instead of a both/and. Jesus gave us the Great Commission (Preach the Gospel and make disciples) and the Great Commandment (Love God and love your neighbor as yourself). These are not in competition with each other, but rather complement each other and go together with one another. As we saw his heart being touched and opened by the “good deeds” he was experiencing as an observer, we took the opportunity to share why we were doing those “good things.” We explained to him that we weren’t doing these things because we were good, but because God is good. We shared how God wants everyone to “taste and see that the Lord is good.” We shared with him what it meant to have a personal relationship with God. At the end of our time, we gave him a copy of one of our Basic Series books on Prayer. He had shared with us earlier that his grandfather was a Christian. I couldn’t help but wonder if God had orchestrated him to be our taxi-driver to answer the prayer of his grand-father for his grandson to one day come to know Jesus too! I believe this is what Jesus meant by what He said in Matthew 5:14-16: You are the light of the world. A town built on a hill cannot be hidden. Neither do people light a lamp and put it under a bowl. Instead they put it on its stand, and it gives light to everyone in the house. In the same way, let your light shine before others, that they may see your good deeds and glorify your Father in heaven. There is much more I could write about, but let me conclude by with this: opportunities to serve and shine forth the goodness of God are all around us. These opportunities can certainly be an inconvenience to our lives and cost us something. I had to leave my wife and four kids for two weeks. This trip cost time and personal expense. In addition, I had to endure two hours of questioning at customs in one country, which was nerve-racking. I also broke my front tooth which presented some challenges and headaches! And we will find that the joy and reward of living this way, far outweighs any sorrow or sacrifice. My one daughter made a comment to me via Face-time one night that I realized was true. She said “Dad you look so happy in all the pictures!” I can honestly say, I am never happier than when I am serving the Lord and seeing needs met around the world. To be honest, I get restless and at times feel empty at home where we have abundance (even though we always find a way to complain about not having enough). $500 provides six month training and a sewing machine for one woman at risk, changing her future and giving her hope: Skill Training. 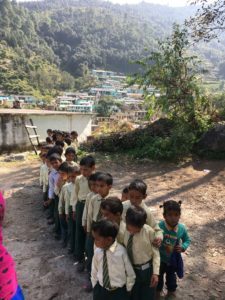 $500 provides a bathroom facility for children at new school in unreached village: Donate here with note in memo. Additional funds will go towards needs of children at centers/schools. Equipping Churches/Pastors with Basic Series: Basic Series Booklets. ***Please contact us at [email protected] for more information or visit our website at: www.weservenow.org.